Agree that the grandma and parents are definitely at fault, however, I still stand by what I said, dogs do not have to be a threat if taught properly. Yes, my thoughts exactly. The dog won't know better if it has bad owners and wasn't trained properly. Every dog has a limit . Well trained or well socialized. A lot people don’t get that even if you do. Every dog has a limit . Anyhow, back to the original post. I feel that the grandma and parents were at fault. I also think this dog needs to be put down, no excuses. It seems my reply didn't get posted... First, thank you all for your feedback! However, there is a miscommunication here. We did not, have never, and would never allow my daughter to be unattended around any dog, not even for a second. My wife and my mom were standing right next to my daughter and the dog (within 2 feet) when it happened -- and this is partly how they were able to break it up so quickly. Surprisingly, my daughter wasn't afraid of dogs after the incident; still, we didn't let my daughter near any dogs for a good six months after -- we would pick her up and carry her around any dog, leashed or not -- but she started developing a fear of dogs. Since dog ownership is on the rise, I want her to know how to be safe around dogs for when she's older, so we have started allowing her to pet dogs under very strict circumstances, where (1) we have seen with our own eyes that the dog is friendly around kids, (2) we (my wife or I) hold the dog so as to prevent it from being able to bite my daughter, and (3) the dog is small enough that we can control it (a lab would be too big). My daughter is still afraid of big dogs, but there's nothing we can do about that for now. We are filing paperwork with animal control that will go to court and ultimately classify the dog as "potentially dangerous" (the county's wording, not mine). Once this happens, my mom will have to basically keep the dog in solitary confinement -- in a dog-proof, child-proof enclosure, and leashed and possibly even muzzled any time it is not in that enclosure. This was my original agreement with her. However, I am clearly unable to enforce it, as she has been violating the agreement, and so now if she violates it, she will be criminally prosecuted. Also, my daughter is not disfigured. No one besides us notices the small spots of discoloration, so it appears only as a single, centimeter-long, shallow scar. I do not think she will need plastic surgery, but we may still consider a civil suit against my mom so that the funds are available if she decides she wants it. Dogs are fully aware of how hard they're biting. All dogs are capable of a level 1 or 2 bite under the right circumstances, and it shows the dog is stressed. 99% of bites are level 1 or 2. A dog who bites at a level 3 might or might not, with extensive behavioral modification training, be able to be rehabilitated. Any dog that bites at a level 4 or above is unanimously considered unable to be rehabilitated, and must live life as a dangerous dog, effectively in solitary confinement. There is no excuse, ever, for a dog to bite at level 4 or above. All you can do is enforce the protection of your daughter. Hopefully, she feels better about dogs as she ages. I was attacked by a large dog breed when I was 11 protecting my poodle. I am 52 now and still terrified of large breeds. My mom after being attacked as a 2 year old ( she needed 3 plastic surgeries and had visible scars into her early 20’s. Now only she can see her scars because she knows where they are. ) was attacked by a large breed dog who weighed more than her and pinned her to her car biting her when she was in her early 30’s. She is terrified. Even though our terror we really adore animals. I had dogs as a kid. I would have them now but my Autistic son doesn’t enjoy dogs. Why are you wasting your time on this? Get the personal injury lawsuit going. That is a win-win situation. Your daughter will eventually be compensated for her pain and suffering and have a fund to fall back on should medical, psychological or aesthetic situations/ complications arise. It also sends a strong message to all those involved and the local courts/community. Researching nonsense like "levels of dog bites" is almost as foolish as allowing the whole situation to happen in the first place. Mind boggling. It's just another way to try and justify bad dogs and to waste time. Dogs should not bite, end of. she's right. Staring down a dog - making intense eye contact - or getting in a dog's face is aggressive. 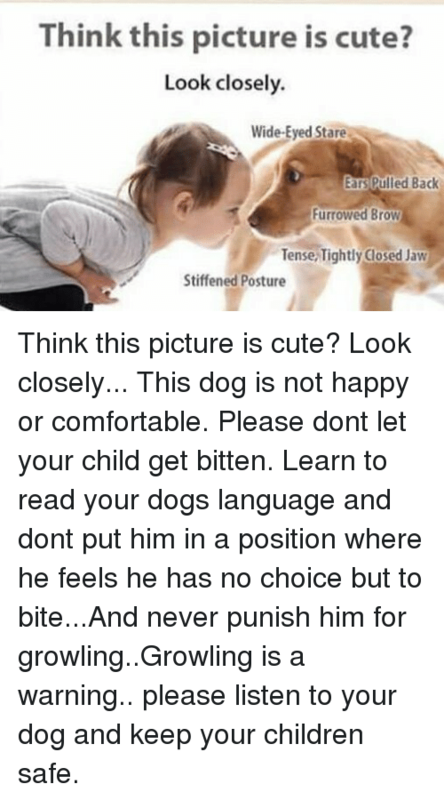 There is body language, leaning away, licking lips, etc, that indicates a dog is uncomfortable and it gets ignored. Also, having an ifant or toddler on the floor with a dog is a no-no -- baby toys and dog toys can look similar. it is up to adults to intervene. A baby on the floor making unusual noises, etc, that a dog is not used to - a dog's prey drive might kick in or ACCIDENTALLY hurt the baby grabbing their pacifier, etc.